An excellent choices for mobile musicians, sound designers, and podcasters. The USB 2.0 bus-powered AudioBox iTwo provides high-quality audio I/O for Mac, PC, and Apple iPad. These compact, ruggedly built interfaces offer high-performance Class A mic preamplifiers, record 24-bit audio at up to 96 kHz, and include powerful, easy-to-use Studio One Artist DAW for Mac and Windows and Capture Duo recording software for iPad. Power amplifiers are classified primarily by the design of the output stage and are designated Class A, B, AB, D, G, or H. In a Class A preamp, the output circuits are always on for the entire cycle of signal swing or the bias current flows at all times. As a result, Class A preamps that use quality components, such as those in the AudioBox iOne and iTwo, have the most linear design, with the least amount of crossover distortion, and they deliver purer, clearer, and more musical results than the Class AB designs that are found in many preamps. Great preamps are crucial to great sound but to get that pro sound, you also need outstanding converters. And to hear what you're doing, you need a headphone amp that keeps up with the rest of the design. That's why PreSonus uses high-quality 24-bit, 96 kHz analog-to-digital and digital-to-analog converters with 105 dB of dynamic range. The DACs feed a pair of balanced ¼-inch, line-level outputs and an ultra-loud, crystal-clear headphone output. 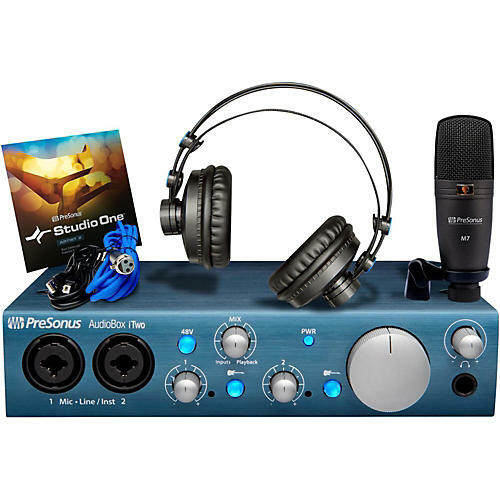 PreSonus designed the AudioBox iTwo to excel as a mobile interface, so they take a serious pounding and remain completely reliable. They're built like small tanks, with a metal chassis and knobs/jacks secured directly to the enclosure to reduce strain on the internal circuit board. Toss the AudioBox iTwo in your backpack or laptop bag and take it along. Wherever your travels take you, your AudioBox i-series interface will be ready to perform. If you're looking for a simple, versatile recording interface with exceptional sound quality that works with a Mac, PC, and iPad, look no further than the AudioBox i series. Because sometimes a simple, well-made, well-designed solution is exactly what you need.